1. 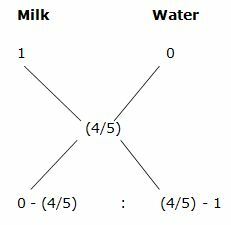 In what ratio water be mixed with milk to earn a profit of 25 % by selling the mixture at cost price? 2. A, B and C can fill the tank in 12, 15 and 18 hrs respectively. If only A can fill the tank on the first hr, A and B fill the tank together on the second hr, A and C fill the tank together on the third hr. If they fill the tank in same sequence till the tank gets filled, then find in how many hours the tank can be filled? 3. A, B and C together have Rs. 22800. If 8/15th of A’s amount is equal to 4/5th of B’s amount and 3/8th of B’s amount is equal to 9/16th of C’s amount, then how much amount does C have? 4. A bus covers the first 36 km in 24 mins and the remaining 69 km in one hour. Find the average speed of the bus? 5. The population of a town is 47000. If the number of men increases by 8 % and the women increases by 5 %, then the population after one year is 50100. Find the difference between the number of men and women in the town? The following bar graph shows the total number of cars produced by 6 different companies in a certain year and the table shows the sold % of cars among them. 6. Find the difference between the total cars sold by the company Q to that of total cars sold by the company S? 7. Find the ratio between the total cars remain unsold by the company P to that of company R? 8. Find the total number of cars sold by company P, R and S together? 9. Total cars produced by company P and U together is approximately what percentage of total cars produced by company Q and S together? 10. Total cars remain unsold by company S is what percentage more/less than the total cars remain unsold by company U? 1) In what ratio water be mixed with milk to earn a profit of 25 % by selling the mixture at cost price? 2) A, B and C can fill the tank in 12, 15 and 18 hrs respectively. If only A can fill the tank on the first hr, A and B fill the tank together on the second hr, A and C fill the tank together on the third hr. If they fill the tank in same sequence till the tank gets filled, then find in how many hours the tank can be filled? 3) A, B and C together have Rs. 22800. If 8/15th of A’s amount is equal to 4/5th of B’s amount and 3/8th of B’s amount is equal to 9/16th of C’s amount, then how much amount does C have? 4) A bus covers the first 36 km in 24 mins and the remaining 69 km in one hour. Find the average speed of the bus? 5) The population of a town is 47000. If the number of men increases by 8 % and the women increases by 5 %, then the population after one year is 50100. Find the difference between the number of men and women in the town? 6) Find the difference between the total cars sold by the company Q to that of total cars sold by the company S? 7) Find the ratio between the total cars remain unsold by the company P to that of company R? 8) Find the total number of cars sold by company P, R and S together? 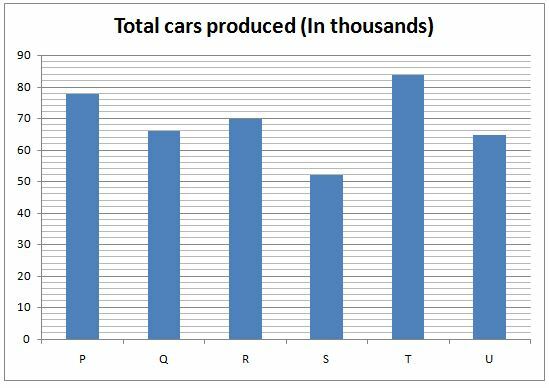 9) Total cars produced by company P and U together is approximately what percentage of total cars produced by company Q and S together? 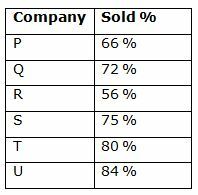 10) Total cars remain unsold by company S is what percentage more/less than the total cars remain unsold by company U?